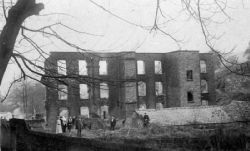 Rainow mill, located beside Mill Cottages in Ingersley Vale, was noted in 1806 as being ‘very old’ and had already been converted from cotton spinning to paper making and, in 1801, back to cotton by Lawrance Plant and William Wagstaff. In 1820 Martin Swindells I and Joseph Brooke took over the mill. In 1848 the mill was burnt down and rebuilt, and converted to steam power. 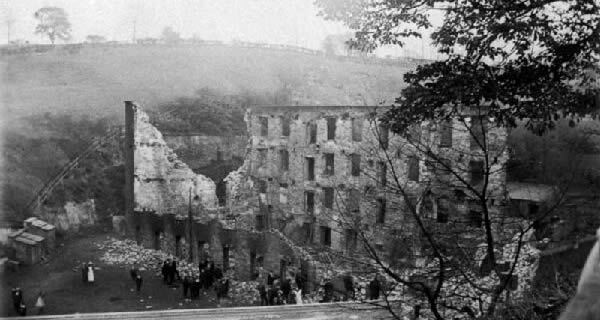 A rather poor picture but the only one we have showing Rainow mill (top left) before it was destroyed by fire. The building in front was the original St John’s school in Church Street. From 1896 to 1906 Heathcote & Sons were in charge and were processing silk (unusual in Bollington). 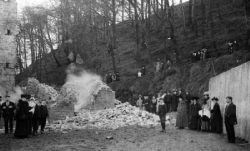 In 1906 they converted back to cotton spinning. 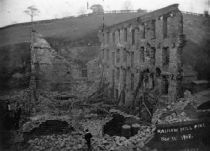 However, they failed to tell their insurers about the change of use so that when the mill burnt down, again, on 11 November 1908, the insurers declined to pay out! The mill was a derelict ruin and was demolished. In the mid 20thC, the present corrugated iron clad single story (plus basement) building was erected on the mill footprint. This building was used for several decades by James McNulty from which he operated his glazing business. This business closed soon after his retirement. The premises have since housed a joinery business. The rear part of the mill site has been occupied for very many years by a pump engineering company. The original mill was water powered and the mill pond was located under the area of level ground behind the mill, the pond having been filled in, probably in the mid 20thC. The river passes under the mill and the yard in front of the mill, then under the house opposite before emerging into the Higher mills pond. See the page on mill ponds.